I love when comic books are used to tell a story that you probably wouldn’t expect from the medium. Recently I reviewed March by Congressman John Lewis which begins the chronicle of his experiences as a young civil rights leader. In that review I mentioned that when I grew up one of the first graphic novels I ever read was Maus. For me, Maus set the standard for comics for a long time. A lot of people still question graphic novels as a form of literature but I never have. And books like March and Hidden just continue to validate my faith in the medium. 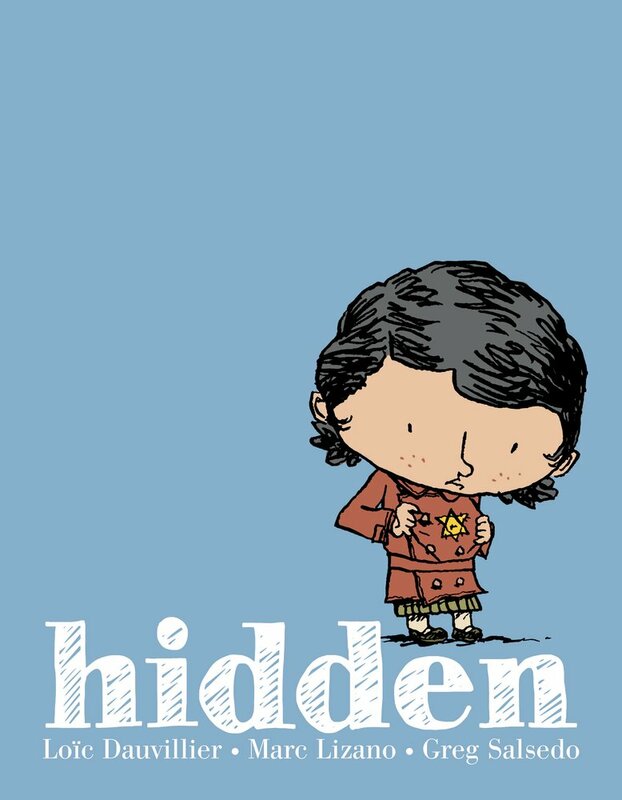 Hidden is a book written, I think, for a much younger audience and unlike a lot of books or stories about the Holocaust it has a happier general feeling to it which I actually appreciated. It’s the kind of book that – unlike Maus – I could see using in a classroom for elementary or middle school students. The book follows a young French girl whose family is Jewish as antisemitism and Nazi influence begins to spread through occupied France. Because she’s young her family does their best to sort of shield her from the way things are. They can’t really explain why people – including her teachers – have started to hate her or why her closest friend and his family have left the country. Her father even pretends that the yellow Star of David they have to wear is a Sheriff’s badge and not something to identify them. But the charades can only last so long and suddenly her parents are taken away by the police and she finds her self being passed along into the care of numerous people who are risking their lives to help her. It’s a very powerful story and it’s being told by the girl when she is much older to her granddaughter one night when both of the can’t sleep. It bounces back and forth as the older woman now tries to explain everything to the younger generation without getting too serious or sad. I thought it was a great dynamic and that it added a lot to the story to have multiple generations involved. This was pretty much a perfect little graphic novel and I really enjoyed it. I cried a few times – especially towards the end. Definitely one of my favorite read recently. A fantastic Holocaust story for younger readers that touches readers of all ages. You’ll be moved by the story but not bogged down too much by the heaviness of the topic. There is a lot more hope and love in this book than anything else and it helps to explain a very terrible time in history to younger children in a way that they can appreciate and understand. I absolutely loved this book and recommend it to anyone looking for a good historical fiction read for the young people in their lives.